The organization of the new Institute has led many faculty and research scientists to talk about a new type of engineering (watch the video directly above), both in the sense that molecular engineering is a nascent field and because the approach represents a new paradigm for investigation. Increasingly, researchers are asking the question: How do systems evolve? And the answers they are coming up with may lead to discoveries like "new polymer materials based on self-assembly of synthetic and bio-inspired materials," referring to the work of Matthew Tirrell. Heading the new Institute for Molecular Engineering, Tirrell was recently recruited from UC Berkeley, where he chaired the Department of Bioengineering and worked as a faculty scientist at the Lawrence Berkeley National Lab. 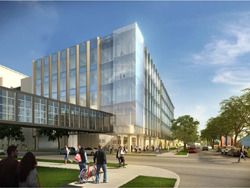 The Institute for Molecular Engineering will be housed in a new building to be constructed on the U Chicago campus, the William Eckhardt Research Center, a 265,000 square foot facility due to be completed in 2015. If you are a science researcher or a supplier of science laboratory tools and equipment in the Chicago area and would like to meet life science researchers, purchasing managers, and industry representatives, plan to attend the 12th Annual Chicago BioResearch Faire ™ Event at the University of Illinois, Chicago Campus, May 12, 2011. Biotechnology Calendar, Inc. provides researchers and science suppliers with the opportunity to connect, network and solve research challenges together throughout the nation.